In her January 9, 2012 Truthout article, Saving the Post Office: The Models of Kiwibank and Japan Post, Ellen Brown argues why the New Zealand and Japanese postal services are a model for saving the U.S. Postal Service. She highlights them because they have public banking operations. She criticizes Stephen Zarlenga’s American Monetary Act as being too radical of a change. On the same basis, I propose a very simple model for saving the U.S. Postal Service, and that is Canada Post. 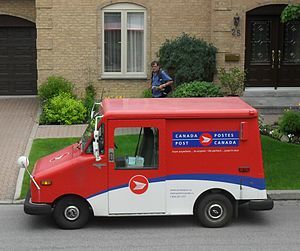 It’s been profitable for the past 16 years, it reported its most profitable year in 2010 despite the ongoing financial crisis, and boasts the third-lowest postage rates among developed countries, despite Canada’s exceptionally low population density. When I applied for a pre-approved mortgage at the height of the financial crisis in early 2009, the bank asked for the current market value of my assets. At the same time, many U.S. banks were marking their assets to model, meaning they could decide what to value them at based on a model they created. While the very banks that marked their assets up based on pre-crash levels to sell mortgages to customers on the basis of having the collateral, they expected something different from their customers. Namely, the current market value of their assets, which were mostly highly depreciated relative to a year prior. On June 21, 2010, Charlie Rose interviewed the president of Russia’s second-largest bank, VTB, which is 85% state-owned. He stated that they had been experiencing 100% annual growth rates, that he believes the Greek rescue package appears to be adequate, and he doesn’t favour for Russia’s banking sector, the separation of commercial and investment banking, as the Glass-Steagall Act had provided for the U.S. prior to 1999. However, try telling that to a loan officer at a bank when you’re applying for a loan. They will ask you what assets you have, and you’ll be required to tell them the current value of your portfolio, not what it once was or what you’d like it to be. The loan you’ll be eligible for, if any, will be based on your current portfolio value.